Today we faught the cold temps and ventured out in seek of stripes on the coldest day of the year. Gary Sundin was on board this morning as we went out bundled up with all the clothes we could wear. Fishing on top was slow due to the drastic change in weather over the last 24 hrs. We were able to catch a few fish on top before we went to the sinking lines to probe the cold abyss. It took a while to find fish we could reach, but when we did boy were they hot. Hooked up right off the bat. We set our drift and on every pass we would get one one. 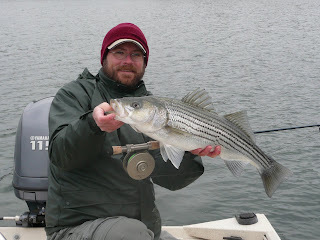 Kudos to Gary with the big fish of the day- a 12lb striper. The largest hybrid of the day went close to 8lbs. It was a great morning, and really enjoyed the company, but man am glad to be sitting in front of the fire thawing out. Best Georgia Trout Fishing Now!